Manchester United have lost for the first time since the Liverpool loss in December 2018. It was 11 matches and 10 wins for Ole Gunnar Solskjaer since then, but on Tuesday night his team met a stronger side. Simply put, Paris Saint-Germain proved how big of a menace they are. Playing without Edinson Cavani and Neymar away from home did not prove to be a crucial factor, as Kyllian Mbappe ran the show at Old Trafford. In the end, the score was 2-0 for the champions of France. Ahead of the rematch at Parc des Princes, PSG will be feeling much better, after being demoralized for missing two or three important players. They got most of the job done in the first match and can start planning for beyond the next three weeks. Angel Di Maria almost got injured on his return to Old Trafford when Ashley Young made sure he felt him in an unnecessary body check just before the dugout. It was not a nice situation for Argentine, but apart from that, all was really good for him. Former Man United player had two assists, one for Kimpembe and one for Mbappe. In fact, Di Maria did not have all that much of the ball. He had 44 touches, just 10 more than Buffon and 12 more than the sub Leandro Paredes. But boy did he make that count. From 31 passes he made, Di Maria created three chances (two of which were scored) and added two shots to that tally. His use of the left pocket, between Bailly and Young, was also intelligent. Manchester United did not create a single big chance against PSG. That was obvious while watching the game and numbers are also compliant with that feeling. Man United had a total 0.34 expected goals to their name after the match, suggesting how far from scoring a goal they were. That number of 0.34 xG is even worse if we know Man United had 10 shots, making the average value of their shots just 0.034! Simply put, none of the shots was coming from a decent position or situation and no wonder Devils failed to score for the first time since late November and the goalless draw against Crystal Palace. Thomas Tuchel made a surprised choice that was one of the biggest reasons for this win. He opted for a 3-4-2-1 formation which offered him several things – more defensive solidity in central areas where Rashford and Martial are most dangerous, Dani Alves got to play as a wing-back, Di Maria was an attacking midfielder with space to roam into and Mbappe had to be the lone striker. 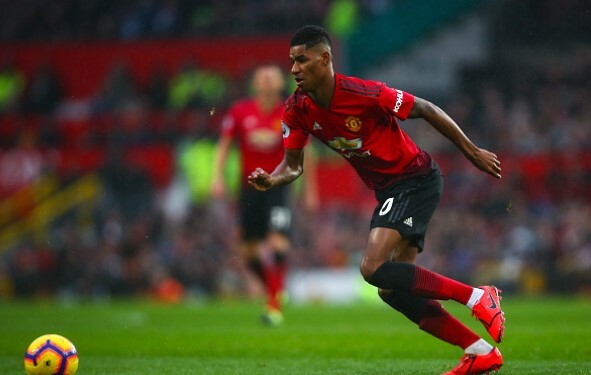 It is the first part that is interesting for Man United’s perspective, as three centre-backs plus Marquinhos, a centre-back put into midfield, and Veratti, made sure there was not enough space for United’s attackers. Rashford struggled, making just six touches in PSG’s box, all of them being in corners far from the goal.